It is possible to generate the delta curve for the wells in Synthetics. As a prerequisite, you need to load an NMO interval velocity volume and select the velocity volume to be used for time/depth conversion as described in Converting Time-Depth. The delta curves will be used to build 3D delta models (see Delta Model) for anisotropic depth migration. 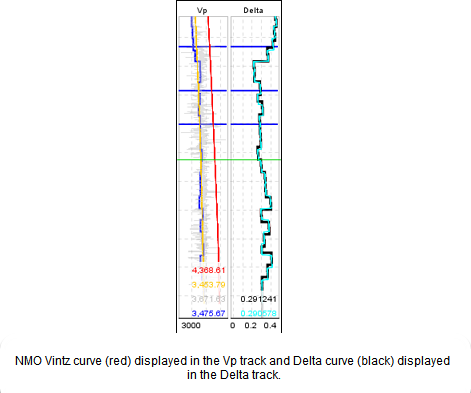 In general, delta is calculated at the wells using the checkshot Vint and an initial (NMO) isotropic Vint field. There is an option to use the small delta approximation for this calculation if you want. The delta curves are automatically (smoothly) extrapolated to the "surface" (either the water bottom value for the well or a user-defined horizon). In the Synthetics window, open the View tab. Under the Tracks section, click the amber circle at Delta to display the Delta track in Synthetics. Open the Delta tab in the Synthetics window. Select the Calculate Delta check box. This is to create the delta curve. Note: Delta values are required to be in the range of -0.25 to 0.35. At NMO Vint, the velocity volume selected for time/depth conversion is shown. Select the Use Small Delta Approx check box to use the small delta approximation algorithm for calculation. At Extrapolation Top, select Well Water Bottom or Horizon (and select the water bottom horizon). This parameter defines the depth above which the delta value will be extrapolated. Type the display sample interval for the delta curve at Display Sample Interval (m). By default, this is set to "20". At Smoothing Window (m), type the smoothing value for the delta curve. By default, this is set to "12". No Blocking — Display the smoothed delta based on the display sample interval. Regular Blocking — Use the regular blocking option and type the block size in meters for the delta curve (this is equivalent to making a coarse sample interval). Horizon Blocking — Use the horizon blocking option and select the horizon(s) used in the blocking. To add the horizons, click the Add Row icon.